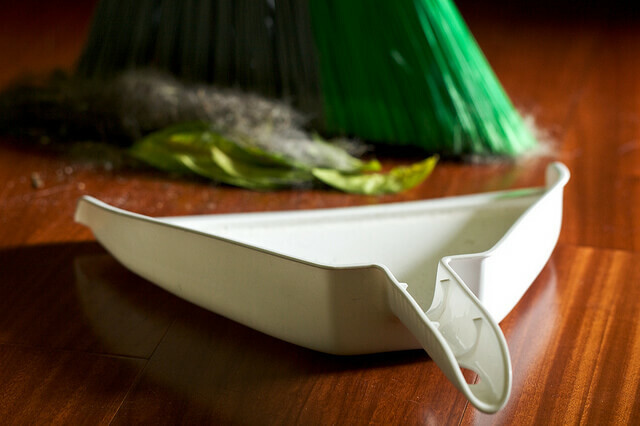 Of the handful of absolutely essential cleaning tools, a broom and dustpan set (not a brush and dustpan set) is near the top of the “must have” list. Everybody has one. I’d also hesitantly say that they’re responsible for a lot of frustration! Crumbs and dirt not getting into the pan properly, dirty, ineffective bristles, broken dustpans – I bet you know what I’m talking about. Though I’m coming to the subject as a gardener, I’ve tried to keep this article as broad as possible. I’ve focused on indoor sets, but also included two sets that are suitable for outdoor use. I’ve done a separate article that takes a look at some of the best outdoor brooms if you’re specifically looking for one. Otherwise, let’s dive in. 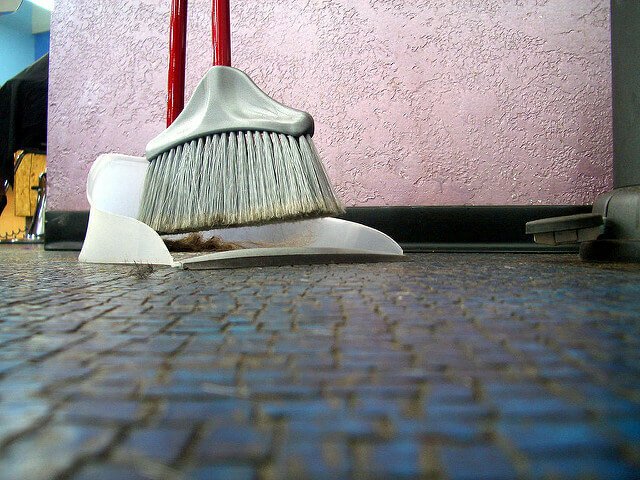 Click here to jump to our in-depth reviews of the best broom and dustpan sets. What is a broom and dustpan set? 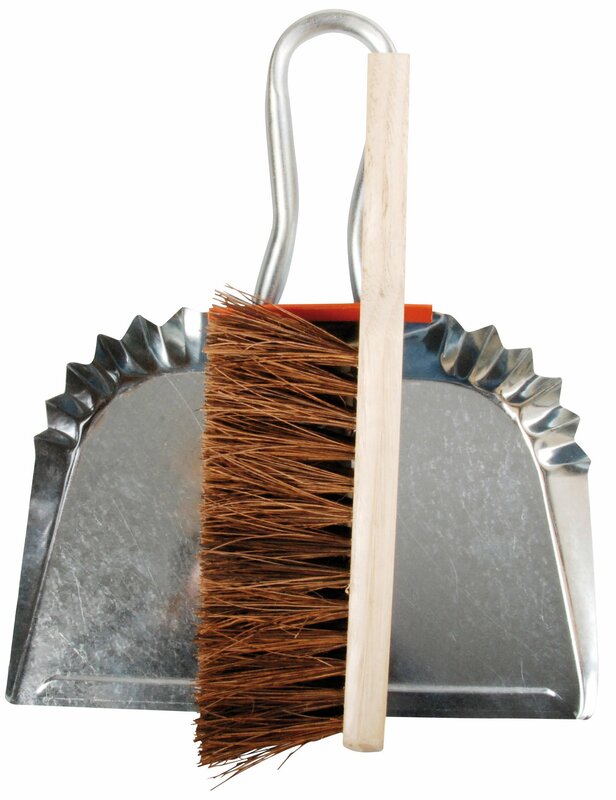 It’s worth distinguishing between the terms “broom and dustpan set” and “dustpan and brush”. A broom has a long-handle and the pan might also have a long handle. A brush and its pan don’t. It’s that simple. I’ve been a bit lax with the exact definition in this set of reviews because the two terms are often used interchangeably. I’ve focused more on brooms, but have also included one brush too, mainly because I think it performs well outdoors. To put it simply: the main difference is the long handle. Brooms tend to be easier to use and they’re usually more intricately made than straight-up brushes. They can be extendable, angled or pivotable to get into tight spaces, and the bristles can be made in a variety of ways to improve their ability to pick up particles. You tend not to see these innovations on brushes. There isn’t any catch-all advice that can be given in this regard. It really depends on purpose. If, as I am, you’re intending to use your broom outside to collect leaves and other gardening debris, then stiff bristles will be a must. Stiff bristles can be something to look for. If, on the other hand, you’re going to be inside most of the time, then you’ll want a relatively “soft-haired” broom that can get into crevices easily and won’t damage your lovely wood panels. Angled heads, which allow you to reach tight corners, can be another thing to look out for. If you’re environmentally inclined, then the use of sustainable materials will also be important. FSC-approved wood and bristles made from recycled materials are features to keep an eye out for. They’ll usually be advertised quite prominently. Top of the list is this set from Casabella, which is ideal for both indoor and outdoor use, given the firmer-than-usual bristles. I often think that the quality of a product, whether it’s a broom, brush or a self-brewing coffee machine, comes through in the details. And there’s a multitude of features that set this “sweep set” apart from the rest. 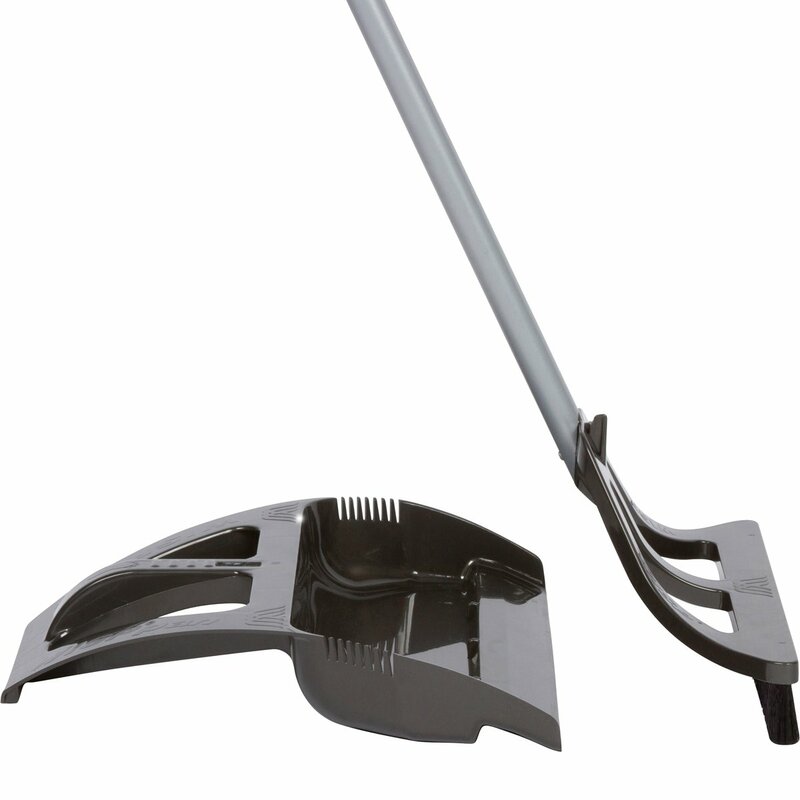 The long-handle dustpan has a clip for attaching the broom, and both the broom and dustpan feature padded ergonomic “pivoting” handles. This allows you to rotate the handle 90 degrees so that it’s flat. There is also a foot rest behind the pan which makes collecting dirt and debris easier. At only 1.7 lbs, it’s also rather lightweight. It’s very well-made and a good all-rounder. The bristles on the broom of this set are softer than the Casabella model, so it’s more suited to indoor use. If you’re not concerned with using it outside, however, there are a number of interesting features. First off, the pan itself is foldable, which makes for easier storage (the front “shelf” folds backwards). Second, the bristles are “flagged”. This means that the ends are “frayed” to make collecting fine particles easier. Perhaps the most striking feature is the set of red “teeth” attached to the top of the pan. I’ve never seen anything like it before, but it’s a fantastic idea. You can push the bristles against them, thus cleaning them. Because they’re placed above the pan, no extra sweeping is required. A far better option than shaking it outside! 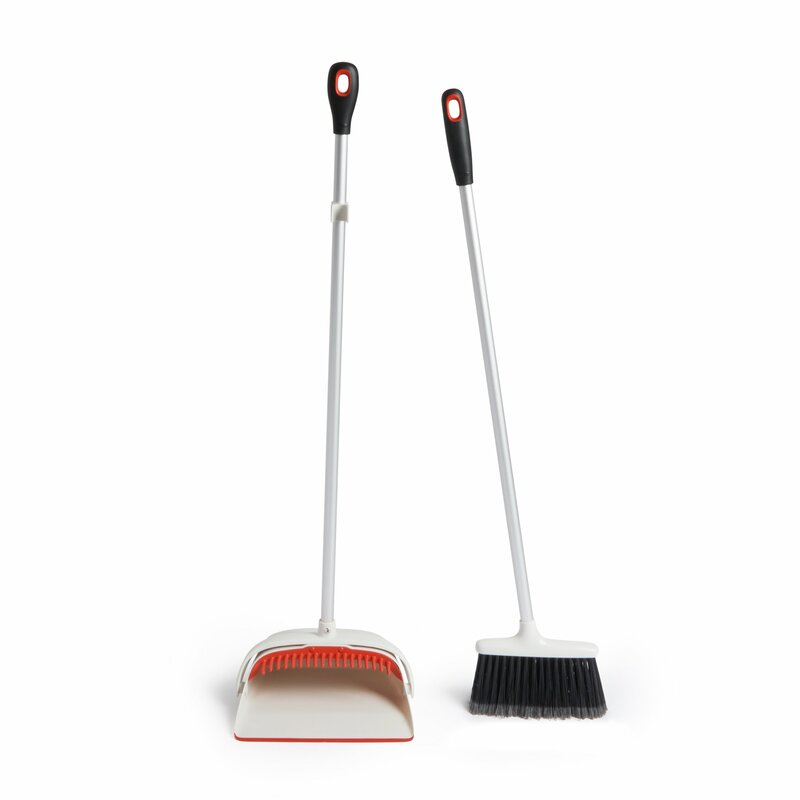 This broom and dustpan set is well worth considering. The “WISPsystem” that it’s based on is noteworthy in a few ways. The pan has both a footrest that can be pressed to tighten the seal between the lip and the floor, and side-combs for cleaning the bristles. The handle is extendible from 29 inches to 51 inches, which is a boon when it comes to storage. They’re keen on touting the advantages of their patented “electrostatic bristles”. What precisely the technology underlying them involves I’m not sure, but suffice to say that tiny particles will have a harder time avoiding the bin! It also stores easily because the pan can be “hung” on the top of the head. A good indoor choice. I’ve already talked about the difference between the terms “dustpan and brush” and “dustpan and broom” but I though I would include a great option for small-space gardeners. This set from Esschert is wonderful. Apart from looking great, it’s well-built, hard-wearing, and ideal for use outdoors. The wood used to make the handle is FSC-approved (something that is fortunately happening with a lot more gardening products nowadays) and the bristles are made from palm leaves. It’s difficult to find robust sets that aren’t made from plastic and synthetic bristles, so I would jump on this if you need a brush and pan for use outside. It’s probably a little too hard for indoor use. Ok, so this isn’t a broom and and dustpan set. It’s just a broom. As I’ve already mentioned, a while ago I wrote an in-depth article on outdoor brooms that you might be interested in. If you’re not keen on any of the sets above then it might be worth putting together your own! I’d recommend a fairly basic pan (they’re easily replaceable) along with a high-quality broom, designed for indoor or outdoor use depending on what you need. 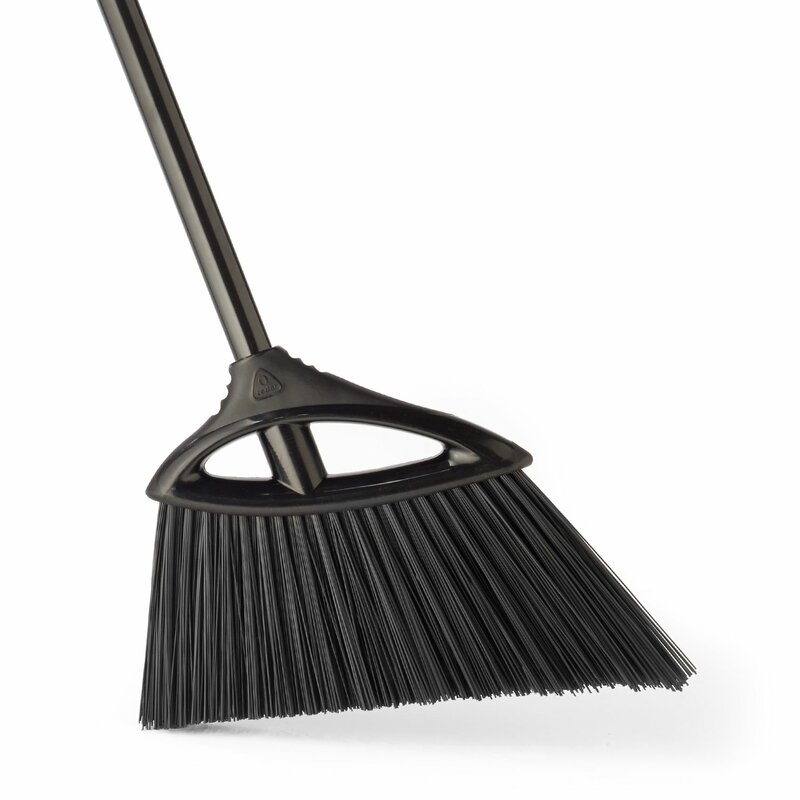 This angle broom from O-Cedar is ideal for outdoor use and the design makes it easy to get into tight crevices. The bristles, which are 80% recycled, are very stiff. Though the intended use is for outdoors, I imagine it would work well inside too. Have you tried any of the sets on this list? If you have then please get in touch and let me know what your experience is. Image credits: The Simple Life by Susy Morris; Dustpan and Broom by Jonathan Khoo.